We’re meeting on the 20th anniversary tour celebrating the release of your highly acclaimed album “Meantime” which had a big impact on rock music in the 90s and beyond. When you were releasing the record I guess you couldn’t have expected what exactly was going to happen with the album [“Meantime” went gold, the song “In the meantime” got a Grammy nomination for “Best Metal Performance”] but how much were you convinced that this album was different from anything else out there at that time? Did you feel it could be a breakthrough for you? I didn’t think in terms of commercial breakthrough at all. I knew “Meantime” was musically good and unique. I knew it was something nobody had done before. I was very confident about it but I didn’t think about it in terms of would sell or not. Is it true that 20 labels wanted to sign you before “Meantime” was released? Yeah, a bunch of labels. I don’t remember how many exactly, but there were a lot. Whose idea was it to organize this anniversary tour? Jan Quiel is our promoter from Cologne and that was his idea. Jan is a brilliant guy, we just love him. He’s been promoting our shows for 5 or 6 years and we’ve become very close with him. He brought this up to me and I said if you think that can help us get to Europe then I’m absolutely game. He pushed the subject with our management and booking agent in London and here we are. If it wasn’t for him it wouldn’t have been done. I would never ever suggest that we play one album at the shows. Recently it became a bit trendy. Yeah, but it’s not my thing. I prefer to prepare separate sets. We have so many albums and songs at this point, that generally we write out our set every night. We’ve been playing together for a long time, which makes the band feel so good musically now, that overall we are comfortable to play 70 songs. Yes. For the next tour we’ll do in the US we’re going to retire “Meantime” for a long time and we’re going to brush up about 15 songs we haven’t done in a while. 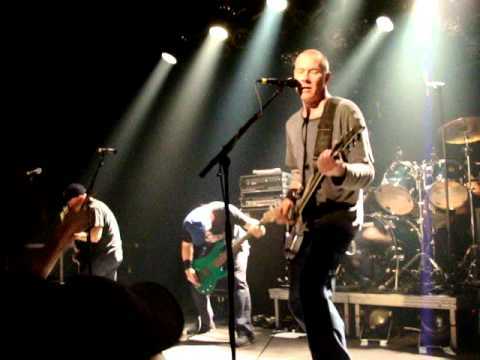 Dawid Bowie, James Hetfield, Elton John, Tool, Deftones – these are only some of the artists that mention Helmet as either one of their favourite bands or inspirations. I wanted to ask you about the inspiration. Igor Stravinsky, Russian composer from the beginning of 20th century, once said: “A good composer does not imitate; he steals”. Would you agree with that? No, I don’t agree with that. With all respect to Stravinsky, I’ve seen his ballets, “The Firebird”, “Petrushka” etc., it’s amazing stuff but I would disagree with him. You absorb influences from all over the place, from all your surroundings. In New York there is this mechanistic music going on 24/7. There are subways, trains, machines, all of that is a rhythmic city nature. In nature there is music in the wind. Even in the devices, I have an electric toothbrush so when I brush my teeth I can change pitches by creating electronic vibrations in my nasal cavity. So it’s everywhere. I would agree with Stravinsky only if the he meant stealing forms, not sounds. Yeah, but that’s not stealing. If Beethoven, Mozart or Haydn came before you and were developing sonata form, which all composers in Vienna used at that time, and Bartók employed it years later and now you do it, you’re not stealing but posing creative restrictions upon yourself. It’s like with a painter who has a canvas. The canvas is let’s say 30×60 and these are his restrictions in which he should employ his creativity. What makes great art great, in my opinion, is doing something different and unique with the elements that everyone else is using. Few years ago in an interview you said that you’re still playing in Helmet, touring, doing what you’re doing because rock is still interesting for you. I guess it hasn’t changed because you haven’t stopped, but I wanted to ask you what exactly is still interesting for you in rock and generally in music? Not only the genre, but the music industry itself has changed a lot in recent years. You can classify Helmet as a rock band where as you wouldn’t classify my jazz thing that way, but it’s still music and to me it’s all related and interesting. Obviously I’ve created limitations for myself in the context of Helmet. I’ve decided over the years it’s going be two guitarist, bassist drums and a guy singing and I guess because I have other musical outlets, I have the jazz thing and the scoring and producing, I don’t feel the need to bring in other things to Helmet. I like the way it is in its sort of purest form. Would we ever want to have a keyboard player or a backing singer? I pretty much doubt it. It’s unnecessary. This band is self-contained. The last movie I wrote, 90% of it was done on the keyboard. There was a lot of sound design stuff, where I would take the cow bell sound and change it, add delays and turn it into another sound. That’s interesting, that’s fun to me as well, I love doing that but I don’t know if it’d be appropriate in Helmet. This band is still mainly about distorted, electronic guitar. Speaking of songs and scoring movies, in terms of how your imagination works, what would you say are main differences between composing a song, be it a rock song or jazz song, and composing a soundtrack? These are quite different structures so I guess in both cases “modus operandi” of your creativity must also vary. If I’m scoring a movie I try to come up with some kind of thematic material for the character or mood in the film, for example it might be a rhythmic thing. With me most things start with rhythm. Rhythm is the source of all music. For example I can go just “aaaaaa”, but if I change it into “aa aa aa”, suddenly it’s music. Things come to me from rhythm, but I also hear stuff in riffs. I hear short things and then I develop them. If there is a certain tempo I might give it some idea, start it at this tempo and after spending time with it and letting it cement itself in my brain, I develop it. The tempo might increase or decrease because as a composer you’re experimenting by trying different things out, applying different forms. Should I develop this into the verse or into the chorus or just have it as a dynamic riff like in some of our songs eg. “Sinatra” or “Pure” which essentially are one riff ideas that developed. I can write these Helmet riffs on any instrument. If god willing when I write for a 60-piece orchestra in ten years or so, it will sound like Helmet with a 60 piece orchestra and it will still sound like me because those ideas and riffs are products of my way of interpreting things musically. So you have Helmet, jazz, films, production. Do you feel a natural need for your creativity and drive to be in various musical worlds? I think I am a little hyperactive, so I need it all. For example I didn’t want to be just a jazz guitar player, but I wanted to be a jazz guitar player. I wouldn’t want to have just Helmet, but I don’t want to be without Helmet either. With films, it’s never been my dream to be a film composer, but it’s really fun. I like this whole variety. You know, I was doing a film for six weeks and, now I’m on the road with Helmet for five weeks, I get back, then I will do some travelling, judge a band competition in Alaska. I might produce a band up there. That’s all fun for me, I love it. Then when I get back to Helmet it will be fun again. I will be interested. After I do something else I will want to do it again, not force myself to do it. I know I won’t be able to do Helmet forever, because it’s physically more demanding than it is to sit in the chair and play jazz guitar. You know, I stand up, I’m singing, I’m banging my head. But I still feel really strong and good, so it’s been fun.